The first is the Hoe Rough walk on Sunday 30 September. This will be a walk out across some of the less used parts of The Neatherd, on to Northall Green and Hoe, then descending through Hoe Common and across Hoe Rough on the fringes of Beetley, to return along Mill Lane (part of the Wensum Way) and finally down Quebec Road back to the town. Refreshments (hot drink and cake, included in the price as usual) are being provided by Smile (formerly New Flavours) on Quebec Street. Cost set at £5. Hard on the heels of that (almost a pun in there somewhere) is our last walk of the year, on Monday 22 October. This one - Gressenhall walk - starts and ends at Gressenhall Farm & Workhouse, with a loop taking us into the northern part of Dereham before circling round the village. We will end in the café there with the usual drink and cake, included in the price of £6, details of that walk, and an invitation to book, will be sent out immediately after 30 September. As the year will soon be three quarters through, some looking back is inevitable. The committee reviewed recent events, particularly the town walk in July. We were pleased with how this had gone, and were glad we had limited numbers - we had planned for a maximum of 15 (plus some committee members providing support), and this number did seem to be the most that could comfortably be managed as we walked round the town. Thanks go to Dorothy Sneesby for leading this and to her and Tim Birt for producing the excellent booklet given to participants. Thanks are also to due Chris Stebbings and his son Jayden who showed us the Bell Tower of the church, Dereham Antiquarian Society Chairman Dr Peter Wade-Martins who let us into Bishop Bonner’s Cottage Museum, Tim Birt who showed us round Dereham Memorial Hall and Charlie Robinson who gave us a talk (and refreshments) at the Mid-Norfolk Railway Station. We are considering making the booklet we used available for sale (probably £1) for anyone wanting to make the walk on their own. For the future, we are considering a number of options, not mutually exclusive. We could run the walk again (but not until spring) as we had to turn a few people away; and/or we could run a walk focusing on Dereham’s industrial heritage (much of which has now largely vanished, but locations and remnants are still to be found); and/or we could work with Dereham Antiquarian Society to look at joint working to develop both walks and booklets. Your thoughts would be welcome. The August New Routes walk, using all 6 of the newly established (but yet to be brought fully into use and signed by Norfolk County Council) Restricted Byways in the town, plus a brief foray into Badley Moor (by Tim, the only one willing to join the cows), also went well. ... another success story has something of a sting in its tail. The 3000 walks packs which were printed early in the year are now down to a stock of about 550, which we estimate will go over the next 6 months or so. 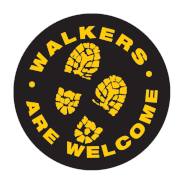 (The library has, as ever, been a major outlet for several hundred packs, but we have also distributed some 700 through businesses in the town - especially the 42 now displaying our Walkers are Welcome logo - and nearly 500 in nearby parishes through which one or more of our featured walks runs.) Given the sometimes lengthy process of seeking funding for a third print run (over £2000 last time), we have to start planning now, and may need to use some of our money as ‘match funding’ for any bid we make. So, we still need to be careful with our cash - and we won’t be offering free walks just yet. Alongside all of this, we have undertaken path maintenance where needed. A particular focus has been on Footpath 14, which runs along Rolling Pin Lane, alongside Dereham Church of England Junior Academy and then on towards the A47. We have conducted litter collections along the section adjacent to the school fence before now, and found the need to do so once more in July: we are in touch with the school as we believe much of the litter has come from the children there. A greater problem occurred when a tree, which had been steadily leaning further across the path towards the school fence, ended up with four substantial branches presenting increasingly low barriers to walkers: at the final stage, the only way past was on hands and knees. This was decidedly not welcoming to walkers, so Tim and I went out and spent a morning cutting it all back to make a full way past once more - go and see! We now look forward to joining the National WaW Annual Get Together in October, this year hosted by our friends in Cromer. Secretary to report back next time. Which brings us back to preparing for 2019. Over the next couple of committee meetings, we will be thinking about what we can and should do next year. If you have requests or ideas, we’d love to hear from you.